For other uses, see Bulbul (disambiguation). 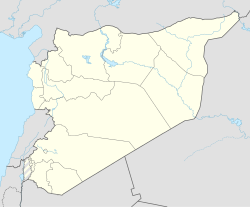 Bulbul (Arabic: بلبل‎) is a village in northern Syria, administratively part of the Aleppo Governorate, located northwest of Aleppo near the Turkish border. Nearby localities include Maydan Ikbis to the west, Rajo to the southwest and Maabatli to the south. According to the Syria Central Bureau of Statistics (CBS), Bulbul had a population of 1,742 in the 2004 census. The town is also the administrative center of the Bulbul nahiyah of the Afrin District consisting of 34 villages with a combined population of 12,573. Bulbul is the administrative center of Nahiya Bulbul of the Afrin District. The word bulbul derives from Arabic: بلبل‎, meaning nightingale in Arabic, Turkish, Persian and Kurdish languages, although in English, bulbul refers to passerine birds of a different family. On 3 February 2018, armed clashes broke out in Bulbul and Rajo between the TFSA and the Syrian Democratic Forces’ Kurdish People's Protection Units (YPG) amidst the Turkish military intervention to capture the Kurdish-held city of Afrin. The village eventually came under the control of Turkish-backed Free Syrian Army. ^ "Syrian War Daily – 3rd of February 2018". Syrian War Daily. This page was last edited on 23 March 2018, at 23:45 (UTC).